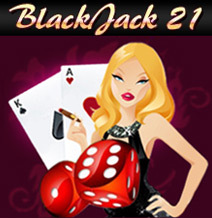 Blackjack 21 provides you with the Basic Rules of Blackjack. If you are a beginner at Blackjack it is important to read through the Rules to get a feel for the game. The Rules listed below are the Rules for original Blackjack but some variations of Blackjack may have slightly different rules which are listed on their reviews. - Players compete against the dealer. - A hand of Blackjack is started when each player is dealt 2 cards face up and the dealer is dealt 1 card face up and 1 card face down. - The aim of the game is to have a hand that totals 21. - If your first 2 cards consist of an Ace and a 10 valued card ( K, Q, J, 10) this is known as Blackjack. - Blackjack always beats a hand of 21. - K, Q, J and 10's all have the value of 10. - An Ace can be counted as 1 or 11. - Cards from 2-10 have the same value as their face value. - When players want another card they 'Hit'. - When players don't want any more cards they 'Stand'. - If a player goes 'Bust' (his hand goes over 21) he automatically loses the hand. - If no one has a hand totaling 21 the next highest hand will win. For Example if the dealer has 19 and the player has 17, the dealer wins. - If the player and the dealers hands tie this is known as a 'Push' and bets are split.